You should make this bread. You really should. Really. That is, of course, if you haven’t done so already. Because you probably have. Because, unlike me, you probably don’t live in a cave and you found out about this amazing no-work bread technique around 150 years ago. Or at least at some point since 2006 when the technique/recipe/game-changer was first published in the New York Times. 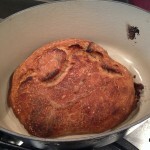 When I counted yesterday there were somewhere close to 8 million blog posts about this bread too. But it would be really very remiss of me not to tell you about it, just in case you too have got this far into your life without having come across it. What is so special about this particular bread is that it essentially allows you, yes YOU, to make a loaf of bread at home that is pretty damn close to a proper ‘artisan’ bakery loaf. But with no effort and no baking skill. The resulting loaf has a crunchy crust, a light texture, lovely open holes inside and something approaching a sort of fermented sourdough flavour. OK, it’s not like the best sourdough you’ve ever had but that is because sourdough is an art form that requires time, and skill, and patience. This charlatan loaf just needs you to throw together some flour, water, salt and yeast and be patient enough to wait 12 or so hours before you eat it. 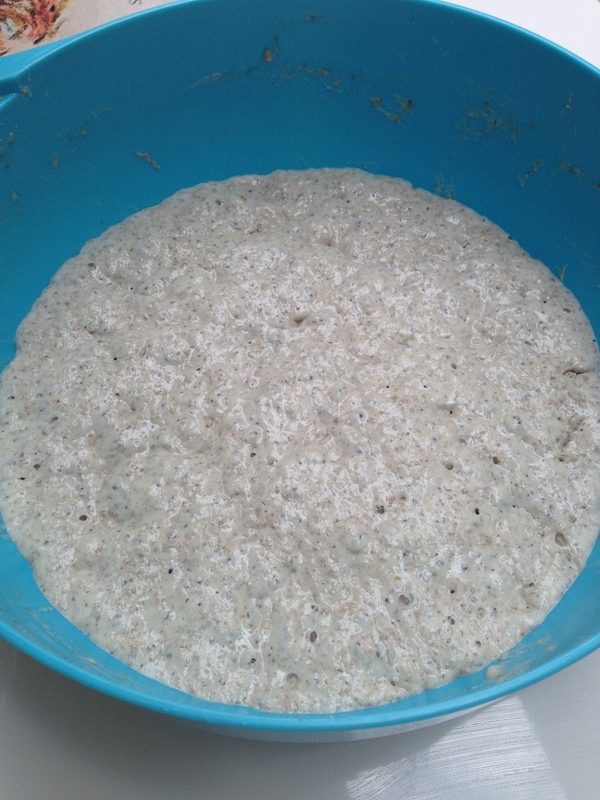 There is no capturing of wild yeasts or maintaining a starter or any of that madness that a true sourdough entails. So, if you are some sort of proper bread baker, you can probably go back to looking at BuzzFeed or growing a beard like Dan Lepard. Everyone else, feel free to read on. This technique was devised by Jim Lahey, owner of the Sullivan Street Bakery in New York City. Without wishing to bore you with the science bit, it is basically awesome because the long fermentation process does all the work to form the gluten strands in the bread, rather than you (or your KitchenAid) doing it through kneading. The recipe results in a very wet dough (very – it’s more than 40% water), which also helps with the gluten thing because the molecules are more mobile or something or whatever. You wouldn’t be able to knead this dough even if – for some weird reason – you wanted to, believe me. Most importantly though, the relatively low amount of yeast and the colder overnight fermentation results in a more complex flavour because the yeast activity is slooooooooowed right down, allowing more time for all the various acids/gases/stuff that give flavour to be produced. But, science aside, did I mention the NO KNEAD bit? The other stroke of genius here is the baking of the bread in a preheated casserole dish (if you got a Le Creuset cast iron thing on your wedding list that will work perfectly but any solid casserole dish with a lid will suffice). This basically creates a little baker’s oven within your crap regular oven that has lots of steam in to create a beautiful chewy crust. Before we get to the recipe, let’s get one thing out of the way first. This uses strong white bread flour. Yep, white refined wheat flour. A substance that seems to get a fair amount of stick these days. Including, I suppose, from me who does, as a rule, tend to eat a lot less white bread than I used to and who leans toward rye and other wholegrain bread day to day. I’m not going to lie – I am one of those converts who believes that refined flours, if eaten too often, aren’t particularly great for us. SO WHY AM I GIVING YOU A WHITE FLOUR RECIPE? Well, that will be because a) white bread is really nice and won’t kill you if you don’t eat it all the time,* b) I have given some suggested percentages for adding wholewheat or other flours and c) I do very firmly believe that if you are making your first forays into the world of home bread making you really do need to start with the white stuff. You need to learn how bread making works, how the dough should look and feel and what to expect when you bake it. White bread flour is by far the easiest thing to start out with as it produces more reliable results for a rookie baker. Naturally, once you have a feel for it you can begin to branch out into the fancier stuff – wholewheat, other grains, enriched doughs, etc, etc. as you will know how much liquid to add, how to make the right adjustments and figure out what has gone wrong when you produce a dense solid flat loaf. But I have found, through my own experience and from talking to others, that if you launch straight into a 100% wholewheat quinoa walnut loaf, without a bit of bread experience under your belt, you are likely to end up with disappointing results and give up on bread making altogether. * I am not a doctor. My best guess is that it probably won’t though. (If you are serious about learning to make bread properly at home, I cannot recommend Richard Bertinet’s book Dough highly enough. His kneading technique – which you can watch on the DVD that comes with the book – will result in you getting dough on your ceiling and in your hair but it is absolutely worth it. 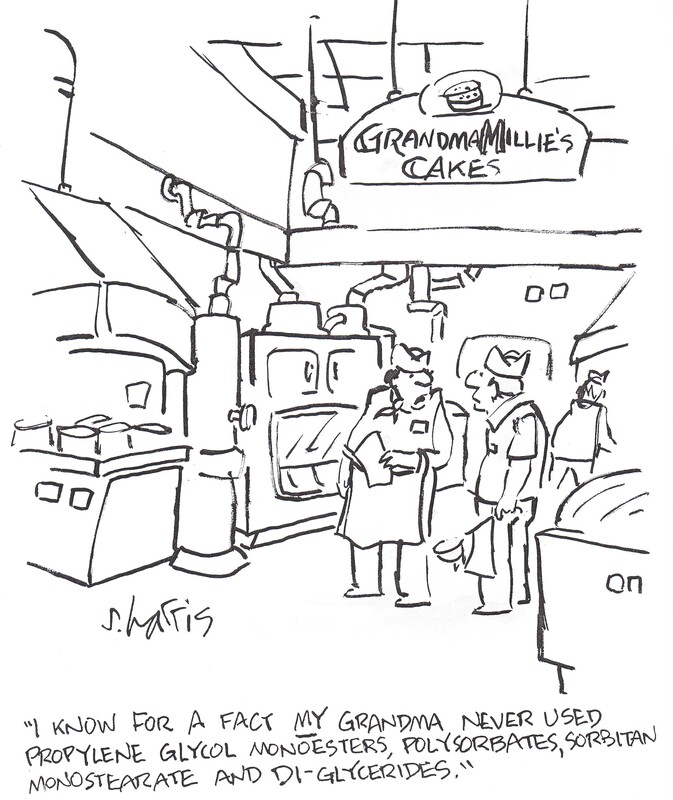 You can then graduate to his second book, Crust, to dabble in sourdoughs, bagels and brioche). Why bother making your own bread at all? Good question. All I can tell you is why I make my own and that is because the most important for me when it comes to bread is knowing exactly what is in it. This far outweighs the colour of the flour: I would choose to eat a small chunk of crusty white french baguette from a proper bakery rather than a slice of wholewheat sandwich loaf that is loaded with soya, emulsifiers and sugar (which they add so that people aren’t put off by the wholewheat flavour) every single time. Tasty! I don’t wish to single out Warburton’s by any means – if you look at the back of most white and brown sandwich loaves you will see a similar story. And if you buy ‘unwrapped’ bread from the bakery section of the supermarket you just have to guess as they aren’t required by law to put any ingredient lists on those at all (which is particularly disappointing given that terms like ‘wholegrain’ and ‘sourdough’ have absolutely no legal definition whatsoever so you really have no idea what you are buying). Now, none of that may bother you in the slightest. I am not saying it necessarily should. We all have our own fights to pick when it comes to healthier eating. One of mine happens to be added sugar and curious soy products in random places I don’t expect to find them and so it’s make your own or spend a small fortune at our local bakery time for me. (Have you noticed how much ‘artisan’ bread costs? We are so used to buying by the loaf that I don’t think we notice how expensive it is. An Italian friend, who is more accustomed to seeing bread priced by the kilo than we are, recently pointed out to me that most ‘artisan’ places in London (including the bigger chains like Paul and Pain Quotidien) are charging around £6 per kilo for bread. That’s the same as Waitrose organic chicken. If you consider that in 2013 the average price of all bread across the UK was £1.80 a kilo, that is fairly staggering. 1kg of organic bread flour from a top-quality British producer like Shipton Mill will cost you £1.14 and will make roughly 2kg or more of bread depending on your recipe – if you can teach yourself to make decent bread at home at least some of the time, you can spend the savings on E481, Dextrose and Calcium Propionate to add to your bread. Or on shoes. Your call). Crazy Ingredient Rating: Very Low Indeed. You need to start this around 13 hours before you want to eat it. 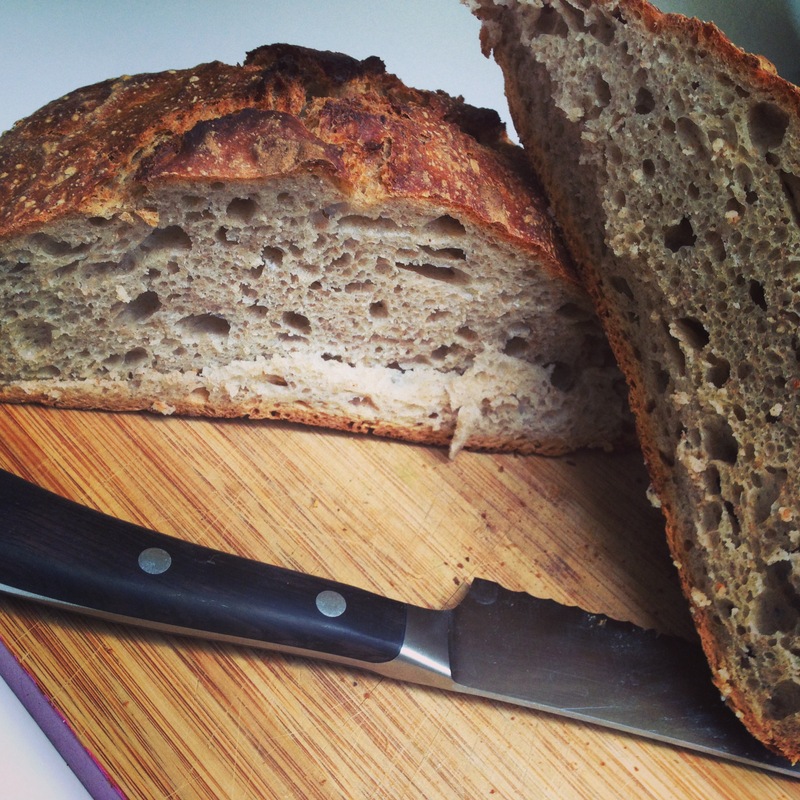 I first came across this recipe via Morgan over at the brilliant Sod Nigella, who got it from Mountain Bakery, a micro-bakery run by somebody called Rose (who does it Around Her Day Job!) in the fine city of Norwich, which some readers will know is very close to my heart. The quantities are slightly different from the Jim Lahey original but I have always done it this way and if it ain’t broke don’t fix it etc. The Mountain Bakery recipe (which I use below) and a very useful instructional video can be found here. 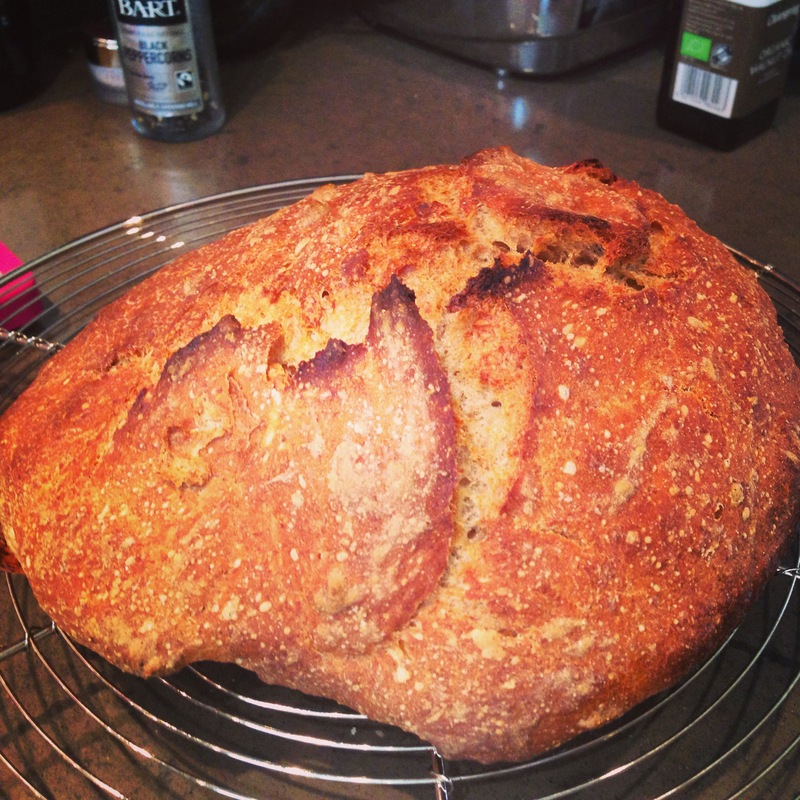 If you need any further encouragement and would like to see a collection of triumphant bread successes by real ordinary normal people using this method (including one of MY early efforts), look no further than the irrepressible Sarah Duggers. 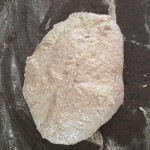 I use one of these dough scraper things to mix the dough and to attempt to deal with it once risen – they are cheap and cheerful and are THE most useful thing you can have when working with any doughs, but particularly wet ones like this. They are brilliant at scraping down work surfaces after you have finished too. I have 5 of them. You know, just in case. I always weigh water for bread making. 350ml weighs 350g but you will be surprised how much variation you can get if you do it by trying to judge it by eye when measuring by volume – quite a lot depends on the angle you look at your jug/cup (and the accuracy of your jug markings). 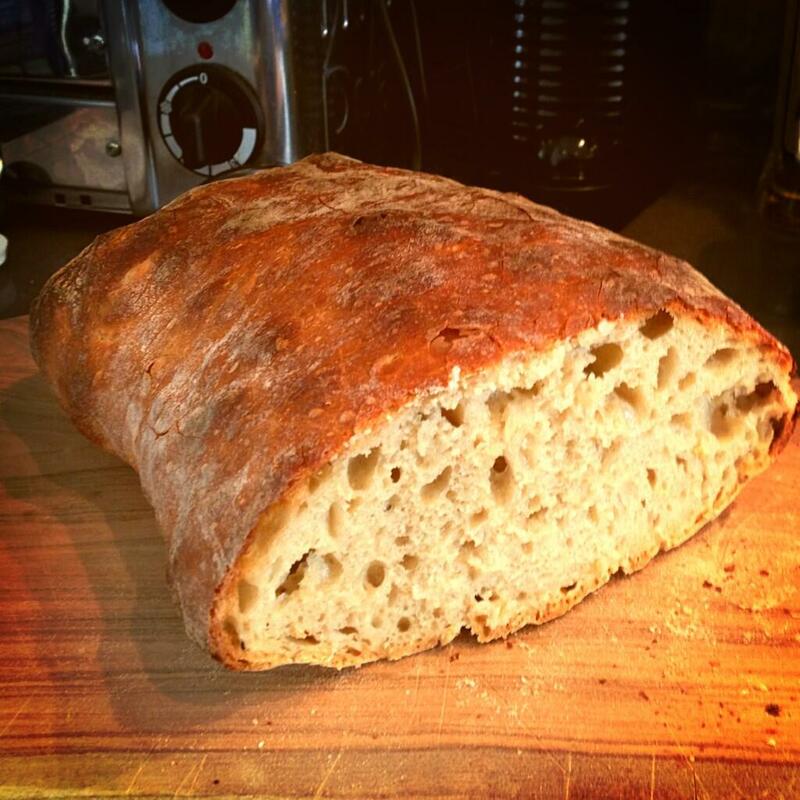 If you test it by weighing it you can often by 10ml+ out, which makes a difference when making bread. Combine the yeast and the water in a large bowl. You should see the yeast beginning to wake up as little bubbles will float up and the water will become slightly cloudy. 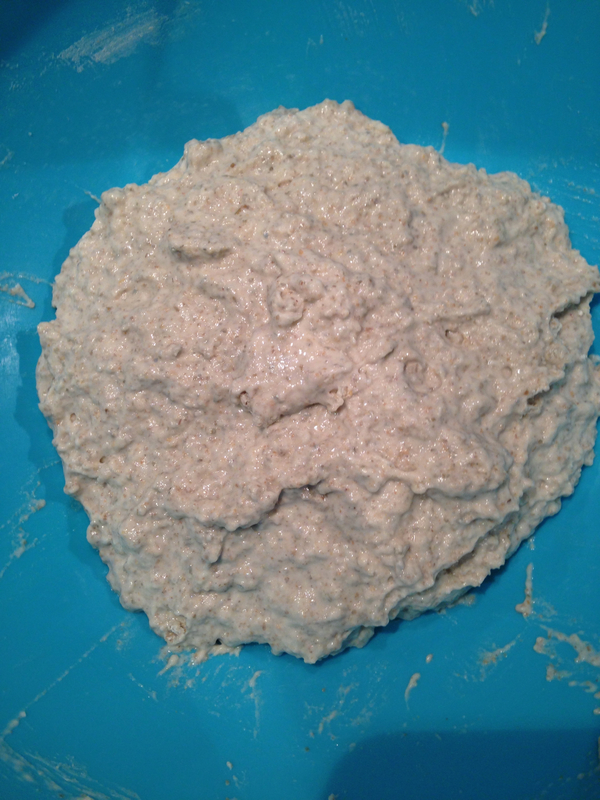 Mix the flour and the salt together well in another bowl and then add to the yeast and water mixture. Stir (or mix with a dough scraper) until it is all blended together. It will be a really wet shaggy sticky dough. Like in the picture below. It looks a bit like Pret porridge. Cover the bowl with cling film and leave at room temperature for 12 hours. Check that the bowl you have chosen will allow the dough to at least double in size. Put your casserole dish with lid on into the oven. Turn the oven to 250ºC (or as close as it will get to that). Flour your work surface well and then scrape the dough out onto it. Try not to knock ALL of the air out of it if you can. Fold it over on itself once. 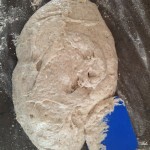 (This is easier said than done – it is a really wet dough so just do your best. It will come right in the oven. The main thing is not to manhandle it too much and knock the air out). Cover with a clean tea towel or some oiled cling film and leave to sit on the counter while the oven heats up. Once your oven is up to temperature, carefully remove the casserole dish from the oven and drop your dough into it. It probably won’t look very elegant but again don’t worry – it somehow miraculously straightens out when cooking. Put the lid on and return to the oven. Cook for 30 minutes with the lid on. After 30 minutes, remove the lid and cook for a further 5-10 minutes to get a really brown crust. Check it from time to time in this last 10 minutes and if it is browning very quickly turn the oven down slightly. Wholegrain Tweaks: You can substitute up to 50% wholewheat bread flour here, albeit you will get a slightly denser less risen loaf. Other, non-wheat, flours can be added in up to 30%. The version in the pictures above is with 30% rye flour and it was delicious. It didn’t rise quite as well as an 100% wheat flour version but the flavour was fantastic and the texture inside was still perfect. I realise now that I failed altogether to follow up on or explain that opening Jimmy Kimmel quote. I had originally written something about the gluten free mania currently gripping just about everyone. But it turned into a rant so I deleted it. I will, however, leave you with this brilliant clip from said edition of Jimmy Kimmel Live, where as part of his segment “Pedestrian Question” they went out and asked some people in a park in LA, who professed to follow gluten free diets, if they knew what gluten was. Enjoy! One of my favorite bread recipes! I usually use around 50% white whole wheat flour which works well. Hi! You have reminded me that I need to post about white whole wheat. It isn’t available in the UK which is such a pain as I see it all the time in US recipes and think it would encourage far more people into wholegrain baking if we had it. I don’t think the ‘albino’ wheat crop is grown here and I haven’t yet found an importer (except an amazon seller who sells for about £100 a bag!!). Next time I come to the US I am filling my suitcase with it!